Posh striker Conor Washington celebrates his goal at Barnsley with Harry Beautyman and Marcus Maddison. Photo: Joe Dent/theposh.com. Peterborough United’s top marksman Conor Washington insists he will make a bigger goal-scoring contribution next season. Washington took his goals tally to 11 for the 2014-15 season with his successful strike in the 1-1 draw at Barnsley on Saturday (April 18). “As a team we haven’t scored enough goals this season,” Washington. “As this is my first full season at League One level I don’t think I’ve done too bad, but I definitely could have done better. “I only scored once in the first 11 games or so which killed my confidence a bit and for the whole of next year I want to maintain my scoring ratio from the second half of this season and then hopefully I will be up around the 20-goal mark. “I was pleased with the goal at Barnsley as I’ve been working on improving my reactions around the penalty area. “I can still score a couple more this season yet and the team is determined to finish on a positive note. We were disappointed not to win at Barnsley, but we will be going all out to win the final two games and finish as high as possible in the table. 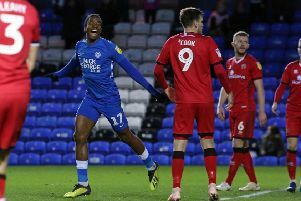 Posh Academy graduate Edwards replaced Washington for the final minute at Barnsley. Posh finish the season at home to Crawley on Saturday, April 25 and away to Oldham on Sunday, May 3.